Fred Richards: Original Prints-Free Delivery-Roe and Moore. Fred Richards was the son of a butcher, he was born in Newport Monmouthshire. He went to Newport School of Art then worked as an uncertified teacher with short spells at St.Ives and Bruges School of Art. By 1905 he had his first art exhibition in Newport. In 1909 he went to study at the Royal College of Art in London. 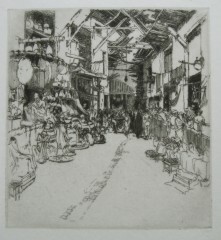 On finishing his RCA diploma in 1912 he visited Normandy and the resulting pencil sketches obtained first prize at the RCA sketch Club. 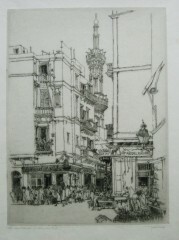 These drawings were seen by the publishers of A&C Black and resulted in him being commissioned to produce the series of illustrated sketch books for which he is best known. The first of these was the ‘Oxford Sketch Book’ of 1913. Some of these books were being republished up until the 1950’s. His first etchings dated from his RCA years and his first one to be hung at the RA was a print of Winchester at the 1912 exhibition. He was elected ARE in 1913, his diploma plate being ‘St.Angelo, Perugia’. He was elected ARCA at around the same time and an RE fellow in 1921. 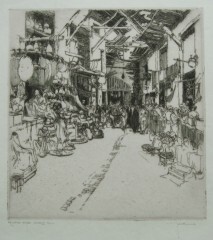 Richards travelled extensively both before and after the First World War, throughout Europe and Morocco before the war and later to the near East including Egypt, Palestine, and Syria. His final journey was to Persia in 1930 and on his return he wrote and illustrated ‘A Persian Journey’. 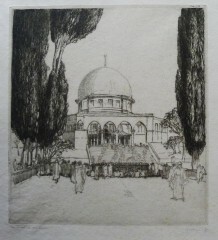 His visits resulted in numerous pencil drawings, many of which were later used as the basis for his etchings. His final illness started after his return from Persia and , although he managed to complete the book, unless others come to light, he only manged to etch around a quarter of the 20-30 plates that his publishers were expecting. As an artist he was undoubtedly a brilliant draughtsman, probably better at working in black and white than colour. 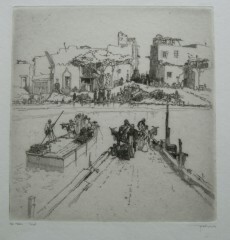 His etchings were published by the leading London art dealers Colnaghi and examples of his works are held in most of the leading public collections and some abroad. 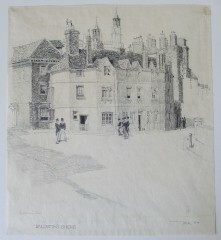 These etchings and drawings were part of Richards estate which passed to a niece after his death and then on to her son who sold them when going abroad to live. 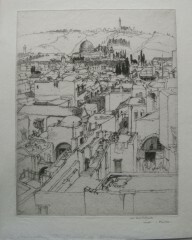 Many of his etchings were, at the time of his death, at his publisher’s Colnaghi’s in London. His executors were fellow artists Martin Hardie and Norman Keene, certainly Martin Hardie was involved with Colnaghis in sorting his works out.